At SoGoSurvey, our main objective is to ensure that once your survey is launched, it doesn’t just disappear into a black hole. SoGoSurvey’s robust Distribution Report shows you exactly who has received your invitation, who has not and why, and even who has opened the invitation but has not yet participated. – Distribution Report allows the survey creator to monitor the distribution of survey invitations and participation specifics. 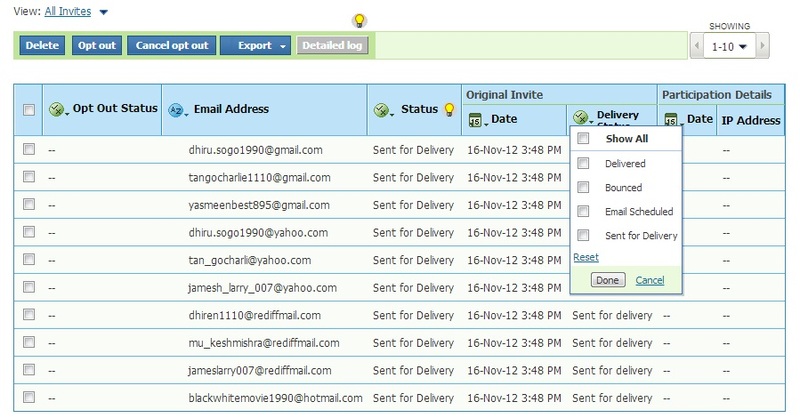 You can also verify delivery dates and analyze possible reasons for unsatisfactory response rates. 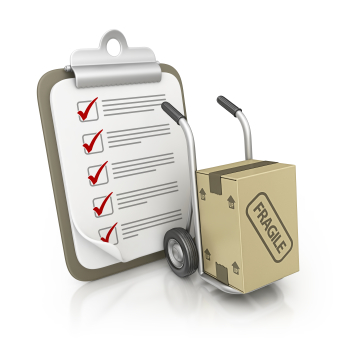 – Distribution Report allows you to export selected records from the survey. For Public Surveys: The Distribution Report displays the following fields: Opt-Out Status, Email Address, Sent Date/Time and Sent Delivery status. For Private Surveys: The Distribution Report displays the following fields: Opt-Out, Email Address, Sent Date/Time, Sent Delivery Status, Participation Status and Participation Date/Time. Note: If the survey is anonymous, most of the identifying information is private and cannot be viewed by the survey creator. The Distribution Report displays Opt-Out Status, Email Address, Status of Sent Mails, Date and Delivery Status, and IP Addresses for both Private and Public Surveys. – Opt-Out Status: The participant who received the invitation email has opted-out of just this survey, opted-out of this and all future surveys or done neither. You can filter email addresses accordingly. – Email Addresses: Lists all of the addresses where the survey invite has been sent. You can filter email addresses alphabetically. – Completed: The survey has been completed and submitted by the participant. – Incomplete: The respondent has clicked on the Save and Continue option during participation. – Email Read/Not Participated: The respondent has read the invitation email, but has not yet participated. – Bounced: The respondent’s email address was bounced back to the sender. – Email Scheduled: The invitations are scheduled to be sent at a particular date and time in the future. – Sent for Delivery:Lists the emails that have been sent to participants. – Dropped Out: The respondent has abandoned the survey. – Email Delivered/Not Read: Invitation has been delivered but not read by the participant. – Delivered: The invite has reached the inbox. – Bounced: The respondent did not receive the invitation because their mailbox is full, their email address is invalid or due to other technical issues. – Email Scheduled: The invitations are scheduled for a particular date and time in the future. – Sent for Delivery: The emails have been sent to the participants. Participation details display the date the participant participated in the survey and their IP address, unless the survey is anonymous. 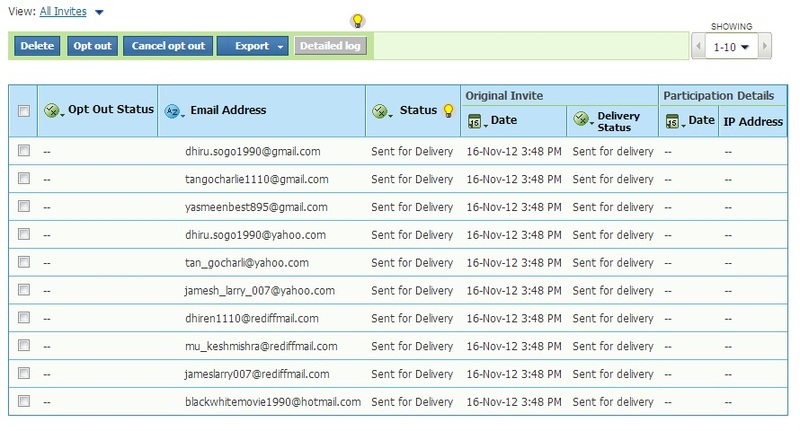 Clicking on Distribution Report will display five options: Delete, Opt-Out, Cancel Opt-Out, Export and Detailed Log. – Delete: The email identification will be deleted from the log after confirmation of the deletion message. – Opt-Out: Unsubscribes email addresses from receiving future survey invitations. Once you have unsubscribed to any of the email addresses, the status shows ‘Opted-Out’ next to the email identification. 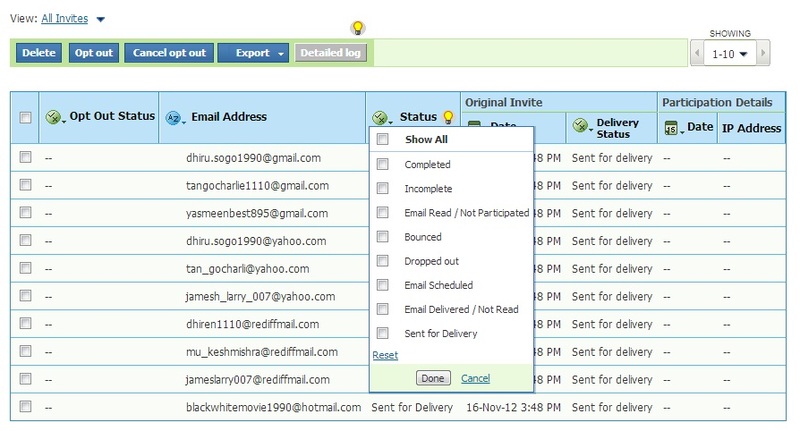 – Cancel Opt-Out: Allows you to send survey invitations to an email address that had previously opted out. – Export: Allows you to export records from the Distribution Report into an Excel document. This option also allows you to apply filters to your records before you export them. – Detailed Log: Shows every survey activity performed by the participant. Distribution Report’s powerful features allow the survey administrator to monitor minute details about all survey participants. Whether you need to know when a participant received their invitation, or when they submitted the survey, Distribution Report gives you access to this and more information in real time.